There are several most eye catching focal points in any given living room. As a rule, a sofa and a TV stand are very important parts of the environment. If you are looking for TV stands that can showcase your sleek contemporary interior, pay attention to these 10 modern and cool TV stands — each of them has what it takes to cheer the room up. 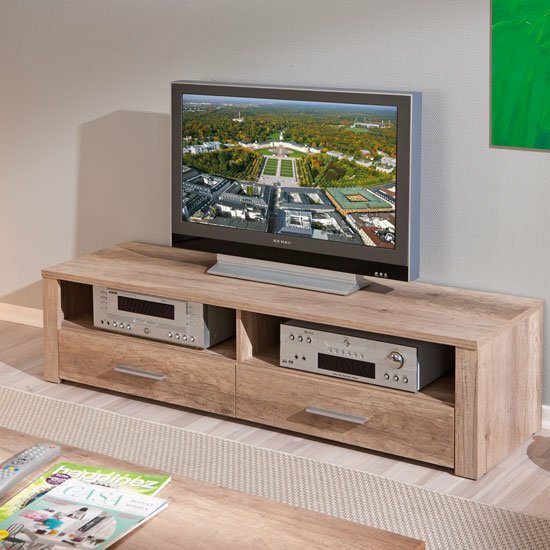 If you are looking for modern and cool TV stands that at the same time feature very time relevant shades, the best thing for you would be to go with light shades of wood. Dark wood shades are also quite possible — and the major reason to go with something darker is that these stands can create a very impressive contrast with light living room walls. 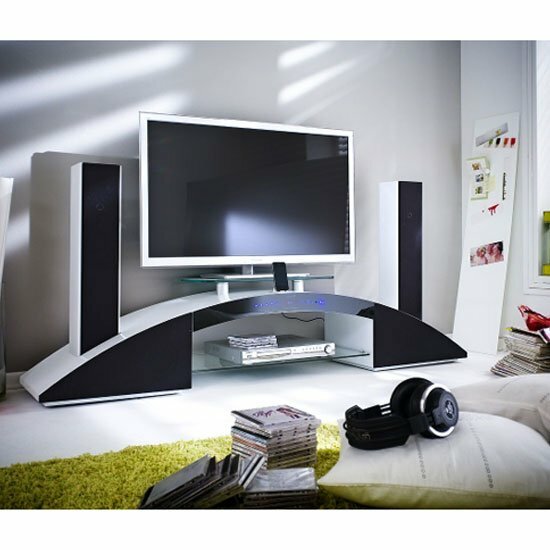 Another great example on modern and cool TV stands would be to go with high gloss models. Mostly available in neutral, classic shades, such as white, black and taupe, these great models feature memorable look and minimalistic design. A lot of high gloss stands come with LED lighting, which is one of the most modern and definitely one of the coolest additions to a contemporary TV stand. Some wooden models are available with LEDs, too. If the living room is small, you might want to give corner TV stands a shot. No matter if designed in wood, gloss, or plastic, these stands offer an optimal solution to optimising your room space. If the room is not very small, but narrow, you might want to play along to its shape. 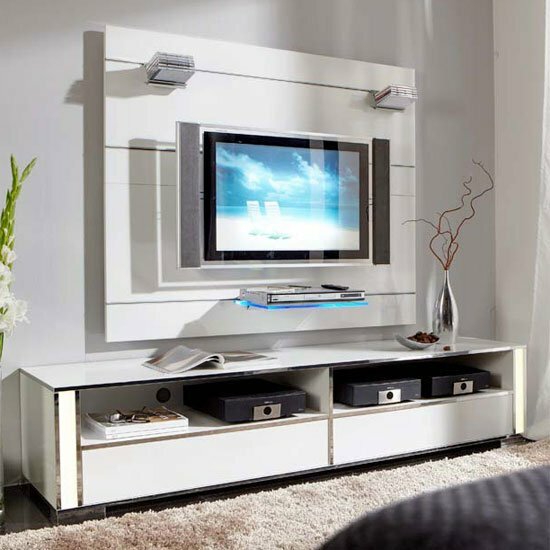 Narrow low standing TV cabinets are available in many materials, of which wood, high gloss, and glass are the most popular ones. A room with minimum decoration will greatly benefit from an acryl stand. Sleek svelte designs and transparent material will look astonishing in any modern setting. If you are looking for something brighter than simple transparent acryl, give chrome and glass a shot. 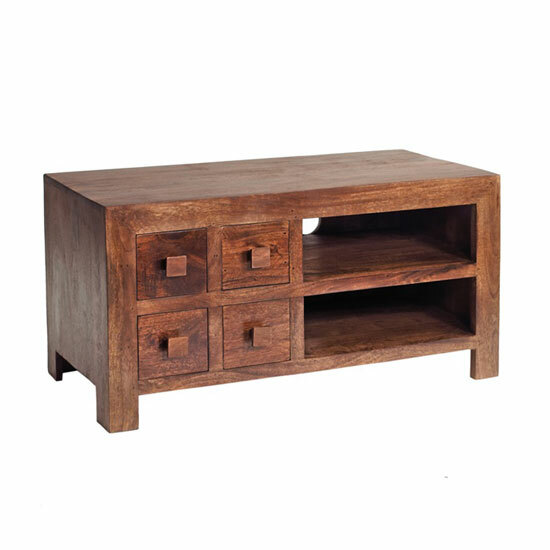 Perfect for hi-tech interiors, these modern and cool TV stands will become memorable additions to a contemporary living room. Another bright and modern idea is tempered glass. Time relevant and luxurious, tinted glass looks best of all in black. On the whole, glass is one of the best ideas to give any room a modern, time relevant look. It is amazing in combination with wood and high gloss — not only chrome and metal.